UPDATE 5:30 PM: Several people contacted me wanting more info on this subject and I want to make sure everyone understands that what the governor is proposing IS NOT SET IN STONE and is NOT FINAL. The legislature still has to sign onto this and we're at the VERY BEGINNING of the budget process. Although I did state this at the end of this post but in looking at the title of this post, I can see how someone who did not understand the budget process could get the impression that the funds were cut and that was that. Because of that, I updated the title of the post in order to better clarify the situation BUT without feedback from the public to out local State Reps, you can be sure that this proposal WILL become a reality. In what's now a sign of the times, the ripple effect of the state's looming budget deficit can be felt here in Danbury as Gov. Rell has proposed cutting the funding to fix repairs at he Richter House. As state leaders grapple with how to make do with less, Gov. M. Jodi Rell has proposed canceling $389 million in state and local bond projects, forcing cash-strapped towns to decide whether they can, or want to, fund their own dreams. "The projects are pretty clearly not essential in economic times like we are facing right now," said Rich Harris, a Rell spokesman. "They can't be a priority right now." Not a priority for state officials, perhaps. "They're projects of local significance," said state Sen. Donald DeFronzo, D- New Britain. "If the state doesn't chip in, those are expenses that local taxpayers will have to pick up." Jeffrey Beckham, a spokesman for the state Office of Policy and Management, said that many of the longtime projects on the list had been added at the request of town officials and legislators, and Rell has said that the state must cut back on its bonded debt. DeFronzo said that the governor's proposed cancellations would cut nearly 19 percent of the total $2.1 billion pending bond list. He also said that the Senate revenue and bonding committee, on which he serves, would probably try to restore some of the projects. A decision has not been made yet on whether projects left on the list will be funded, but they have been deemed a priority, and state officials are hopeful that funds will be allocated in the future, Beckham said. Before I comment on the Richter House, it's REALLY IMPORTANT TO watch this brief video history lesson on the Richter family and what led to the family donating their land to the city. Now that you know about the history of the Richter House and the family's love for the arts, now lets get into the meat of the matter. First and foremost: Richter Park is MUCH more than just a golf course...unfortunately, the people whose job was to oversee the land only thought about the golf course. The current state of the Richter House is TOTALLY due to negligence by The Richter Park Authority (RPA) as well as the City of Danbury...PERIOD. To put it bluntly, throughout the years, the RPA have ignored the deteriorating conditions at the Richter House while focusing their attention to raking in the dough at the golf course...all the while ignoring the Richter family's wish that they take care of the home (a wish that was conveyed to the city by at least one living member of the family during a public hearing on the Richter Park Authority. Instead of attempting to preserve the house, the RPA in it's arrogance cast a 11th hour vote to demolish the family's home. 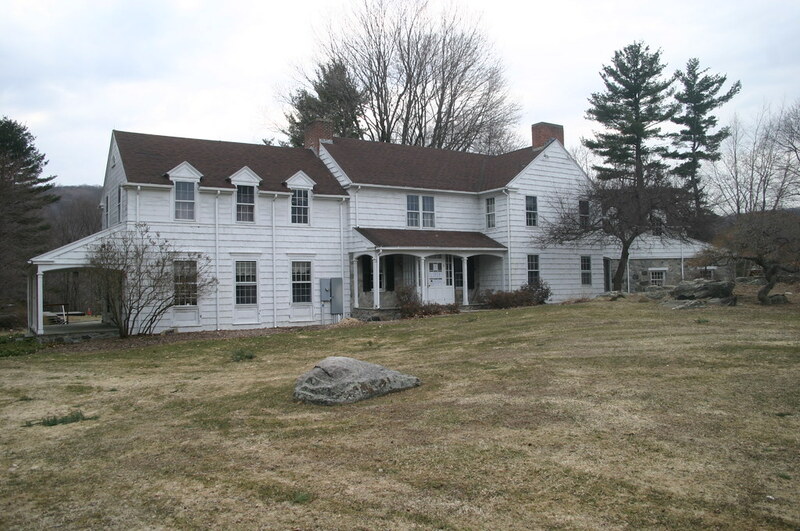 Again, the Richter family wanted that property preserved to "provide for the arts!" The RPA failed to honor the family's request by ignoring the House while focusing their attention to the golf course (i.e. the RPA thinking about tearing up the front lawn of the Richter House for golf course parking). The RPA vote the demolish the home created a large outcry from the people who use the house for plays, concerts, recitals, and other forms of art...something that the family intended to house to be used for. The result of the outcry was the RPA changing their tune about ripping the house down...for now. Second, and more important: The city is also to blame simply because they didn't do their due diligence when it came to making sure that the authority was doing what they were suppose to be doing. Remember, Richter Park is MUCH MORE than a golf course and making sure that the house throughout the years was in shape should have equal priority to the condition of the golf course. This gross malfeasance has resulted in the house to continue to deteriorate and the cost of the repairing the house skyrocket. The end result is a slap in the face to a family that gave so much to this city during a time when they could have sold their land to developers (think about housing developments at that location as opposed to a park). From April 2008, here's video footage of the numerous people who came out to support the saving of the Richter House and echoed the points I raised. Our State Representatives worked hard to get state funding to assist in reparing the house but now, due to the budget crisis, that is in jeopardy. To add insult to injury, THE SITUATION WITH THE HOUSE IS DUE TO THE RPA AND CITY and the buck stops with them, not the state. In short, if the city can magically find money to fund non-essential things such as the Connecticut Film Festival (over 120K) or dish out a whopping 700,000K to preserve the Taylor farm, although NOT ONE DEVELOPER IN THEIR RIGHT MIND IS THINKING ABOUT DEVELOPING LAND NOW OR IN THE NEAR FUTURE (look at the "progress" being made at the BRT development at Kennedy Park), than surly the city can find it within their heart to honor the Richter Family and coughing up the cash necessary to fix the roof OR AT THE VERY LEAST patch the home as best as possible. That being said, although the governor killed the funding for the Richter House doesn't mean it's completely dead yet. 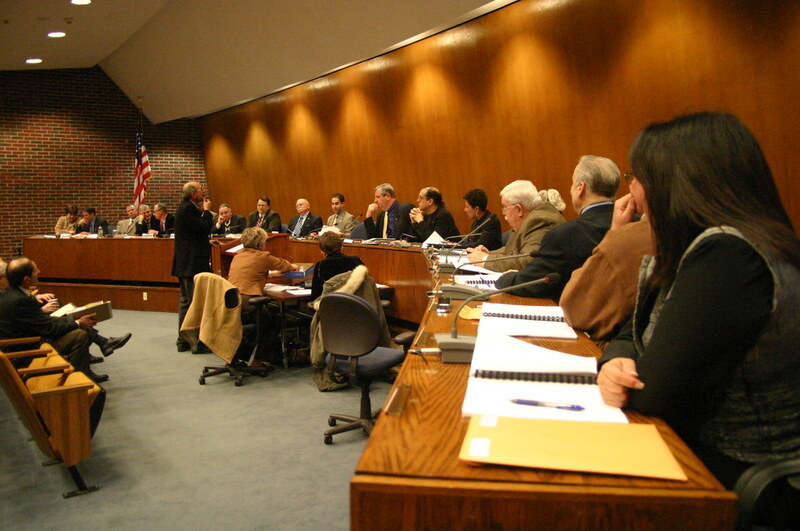 NOTE: For a full detailed list of funding the Gov Rell has cut for Danbury, click here. From Feb 17, here's video footage of the Common Council Special Meeting regarding the vote on the teacher's contract and recommendations to the charter commission. NOTE: This will be an ongoing post as I'm still in the process of uploading video files. ALSO, video footage of the teacher's contract presentation (which happened BEOFRE this meeting) will be posted on Saturday. Will these proposals stimulate the economy? (In honor of New Fairfield's First Selectman outrageous stimulus funds request, this post is bumped to the top. 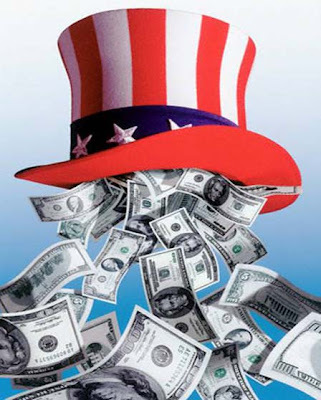 As you know, President Obama signed the stimulus package which will hopefully aid the economy. Since it's passage, a number of websites were launched that are created to keep an eye on where the money is spent. Recently, mayor's and selectmen have come under fire from groups that claim that elected officials are using the stimulus money for projects that will not stimulate the economy. That being the case, I decided to look into what Mayor Boughton requested from the government and present it to you. Well, actually, the site entitled "Stimulus Watch" did all the hard work, all I had to do was click a couple of times. You decide...are Mayor Boughton's request reasonable in terms of stimulating the economy, or is this a form of "pork" spending? Click on each project (which will take you to the Stimulus Watch website) and vote on whether or not you think the particular item will stimulate the economy. (NOTE: The column entitled "Vote Ratio" is the response value of the vote results from the website. A negative number means the readership think that the particular proposed project is pork spending). Below are the "shovel-ready" projects for which this city submitted in the 2008 U.S. Conference of Mayors report. You can click on a project to read (and add to) its description. You can also discuss the project and vote on whether you believe it is critical or not. UPDATE: As a supplement to this post, in a meeting with mayors today President Obama gave municipal leaders a VERY stern warning. To close Connecticut’s academic achievement gap, the largest gap between rich and poor students of any public school system in the nation. We will not rest until every child in our state, regardless of race, ethnicity, or socioeconomic status, has access to a great public school. A statewide outreach, education, and research organization with an active member network of parents, teachers, students, and business and community leaders across Connecticut. ConnCAN is a 501(c)(3) nonprofit organization. The achievement gap is the most urgent social and economic problem facing Connecticut. The time for change is now. All children, regardless of their background, can achieve at a high level when given access to a great public school. Securing “Great Schools for All” will require reforming the way our public schools work by raising standards, giving school leaders greater freedom to innovate, and providing parents with more public school choices. Every child wins when parents can choose among public schools where principals and teachers come together to pursue a shared vision of excellence while being held accountable for results. ConnCan's site offers a wide variety of tools including a "report card" section. After signing up on thier site (it's free), you can view their performance report on ANY school in the state. 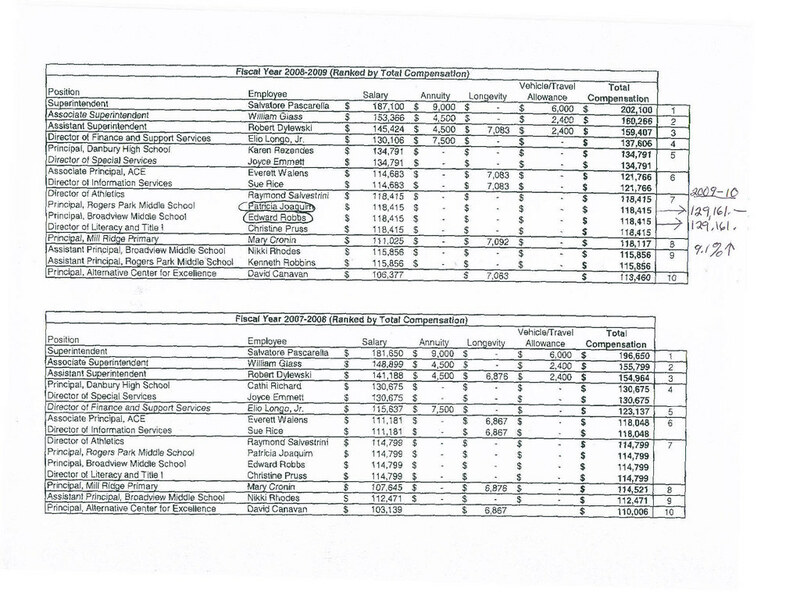 For the purpose of this post, here's their 2008 report on every school in Danbury. To get detailed information on a particular school, just click on the school's name. NOTE: This will be an ongoing post. This blog will be bumped to the top as new video clips are added. 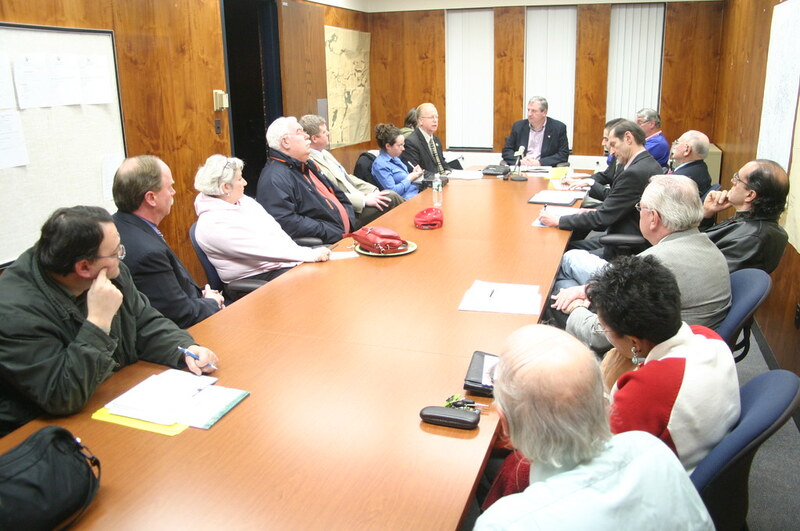 On Feb 9, the Common Council held a public hearing the centered on changes to the city's charter. As I stated in the past, for now I'm going to reserve my thoughts on everything surrounding changes to the charter. At this point, in my opinion, it's more important to get the information regarding what's happening to the charter out to the public...there will always be time to explain the political aspect to the changes later. Since I'm in the process of uploading the videos (which takes quite a bit of time due their size), I'm going to break the video from the meeting into small clips. This should make it easier for people to watch the portion of the meeting that they want to watch while avoiding the rest of the event. Again, this is an ongoing post which will be updated throughtout the next couple of days. 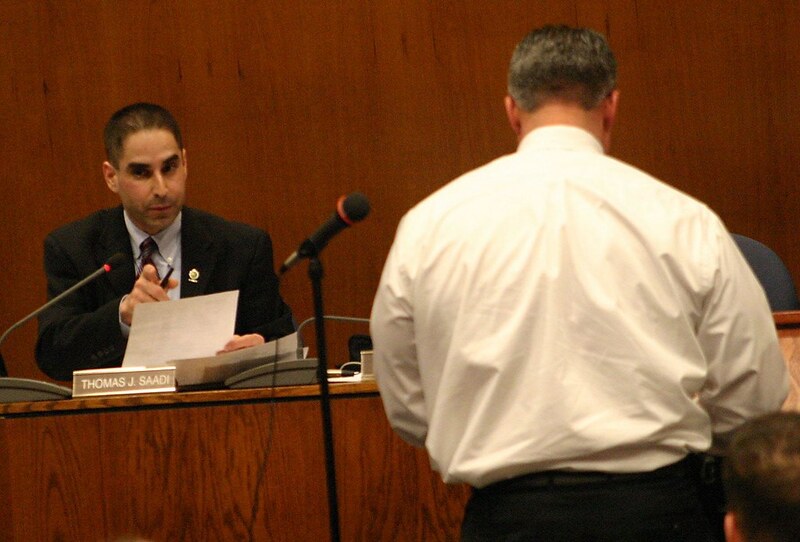 Due to many requests among my readership, and as a follow-up to the interview I conducted with Minority Leader Tom Saadi and Councilman Paul Rotello, here's video footage of the Ad-hoc committee formed to look into the appointment of Mike McLahclan as Director of economic Development. ...I'll have more to say on this topic later. UPDATE: Read the minutes of the meeting filed by our lovely City clerk Jean Natale. Talk about scrubbing the record...read what they said about what Tom Saadi said versus what he really said. Now you can watch what all the hype was about the way it was supposed to be broadcasted. 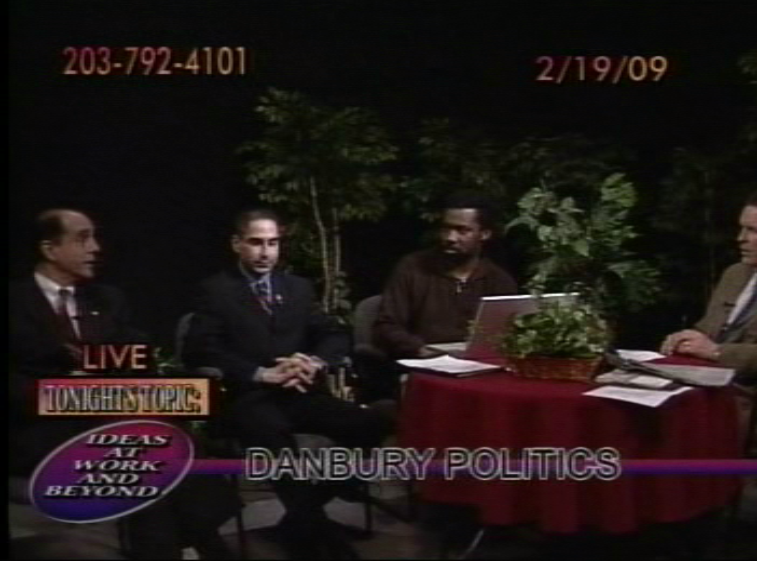 Here's the video-re-mastered/edited interview I conducted with Minority Leader Tom Saadi and Paul Rotello this Thursday on local access TV. 1. State Senator Mike McLachlan's appointment as Director of Economic Development for Danbury. 4. Acquisition of the transfer station.